It is time for a capacious, authoritative one-volume selection of Virginia Woolf's essays and journalism. (Perhaps one is in preparation. I don't know.) The sixth and final volume of her collected essays was released in 2011. It is wondrous, as are all of the volumes in the series, but though it's a goldmine for scholars, the series isn't really aimed at the everyday reader; each volume is relatively expensive (though not to the extent of an academic volume, e.g. the Cambridge Editions), and plenty of the material is ephemeral, repetitive, or esoteric. In 1993, Penguin published a two-volume selection of the essays edited by Rachel Bowlby. For what I assume were reasons of copyright, it was only released in the UK. It's a very good selection of 55 essays total (25 more than Bradshaw), though each volume was a little under 200 pages in length, so it could easily have been a single book. I've been thinking about what it would be useful to have in a new Selected Essays, one built from the now complete Essays volumes. It deserves to be bigger than any of the selections so far, though not so gigantic that it's unwieldy. After all, it's drawing from thousands of pages of material. I would lean toward a length of 400-500 pages, say 150,000 words or so. 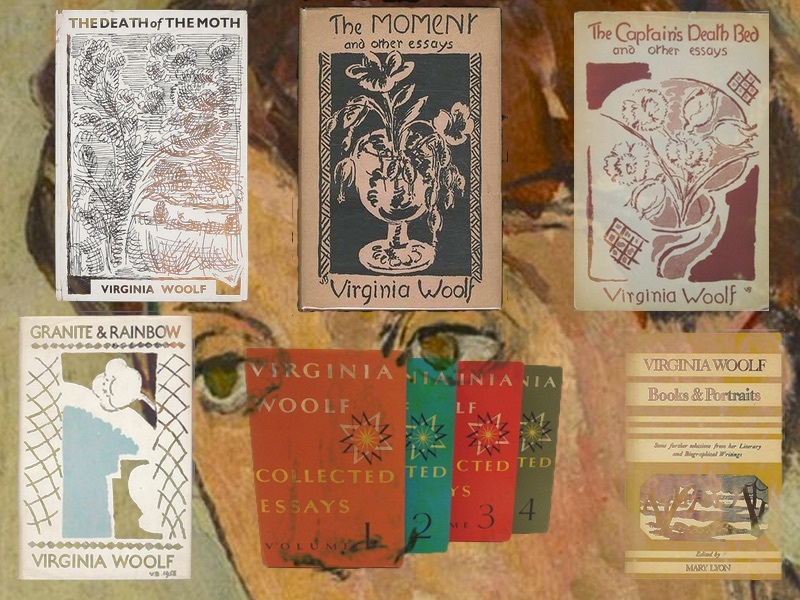 Any imagined table of contents I create must be highly provisional at best, subject to the vagaries of memory and personal taste, but as I think about it, I realize I do have some thought about what would be useful for students and, perhaps most importantly, for ordinary readers to have as a collection of Woolf's essays. Of course, the first priority of such a collection would be to include examples of Woolf's best writing. But beyond that, there's a need to see the development of her thinking and the development of her aesthetic, so we would want the earliest pieces from 1904 ("'The Son of Royal Langbrith'" and "Haworth, November 1904"), as well as thoughtful selections from 1905, the first year with a substantial body of work to choose from. I would err toward inclusion in the early essays, especially since they're mostly quite short. The two essay drafts left unfinished at Woolf's death, "Anon" and "The Reader", would end the book well, particularly since the last sentence of "The Reader" is "We are in a world where nothing is concluded." Additionally, it would be helpful to have a few sets of essays on topics and writers she explored throughout her life. (Bradshaw does a good job of this with his "Women and Fiction" section.) There are dozens, maybe hundreds, of ways to do this, and everyone will have their individual preferences. My own desire would be to make sure there are — in addition to obvious topics such as contemporary writers, English literary classics, women writers, etc. — substantial selections of Woolf's writings on biography, memoir, and autobiography (which she wrote about throughout her career, and which is a topic central to her feminism); on art's relation to politics (a topic that becomes more and more important to her); and on Russian writers (given that she read some of the earliest translations of Chekhov, Tolstoy, Dostoyevsky, Turgenev, etc., that she learned some Russian to be able to collaborate on translations, and that the influence of the 19th century Russian novelists on her aesthetic was significant). The editor would need to give considerable thought to how the book would be organized. My preference would be to arrange the essays chronologically by date of writing (as can best be determined; for instance, though no date has been discovered for "The Death of the Moth", September 1927 is a reasonable educated guess), and then to include a supplementary table of contents grouping the essays by related topics. The opposite would also be a valid choice: arrange the essays in the book by topic/theme and provide a supplementary chronological table of contents. There would also be the question for some essays of which version to print. 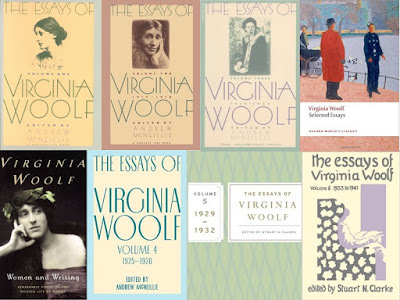 In general, most editors would favor the latest, fullest versions (especially for the Common Reader essays that Woolf herself saw through book production), but with a few key essays, it might be worthwhile to include both early and later versions (e.g. "Mrs. Bennett and Mr. Brown" along with "Character in Fiction"; "Professions for Women" along with "Speech to the London & National Society for Women's Service"). "The Son of Royal Langbrith"
"The Feminine Note in Fiction"
"Modes and Manners of the Nineteenth Century"
"What Is a Good Novel?" "Jane Eyre" and "Wuthering Heights"
"This Is the House of Commons"
I've left out plenty of good essays, and yet this is still much too much muchness for even a big, binding-busting behemoth of a book.